A picture conveys a thousand words, as the saying goes, and quickly provides context or information visually to the website visitor scanning your website or blog. For time sensitive web users, quick visual scanning of the webpage commonly guides the user down and through the page via the use of the images that grab attention, positioning, white space and headlines. Images can do even more, by creating traffic generation to your website when they are found within Google Image Search results, complementing your keywords, SEO and great content marketing approach. Images provide an important design function to the website or article, but they should not significantly increase the loading time of the website as this is an important SEO ranking factor and consideration as load time effects the user experience. In this article we consider some of the best practices for using images to improve the SEO – Search Engine Optimisation value derived from images. Images are content as well! Most of your online content is a balance between the combination of images and text. Commonly your text doesn’t get a look in, unless your images have grabbed that initial attention. Consumers use many different search vectors; text, images, maps, news, videos… to find the answers to questions that they have. According to Google data, 10.1% of their traffic is for images.google.com. Did you know? 87% of consumers research online before entering a store, but more than 90% of goods are still sold in stores. Google Image Search alone is an untapped opportunity that many businesses don’t even consider when it comes to their SEO strategy. You can disrupt your competitor’s traffic and hack Google Image search to drive targeted traffic to your website. 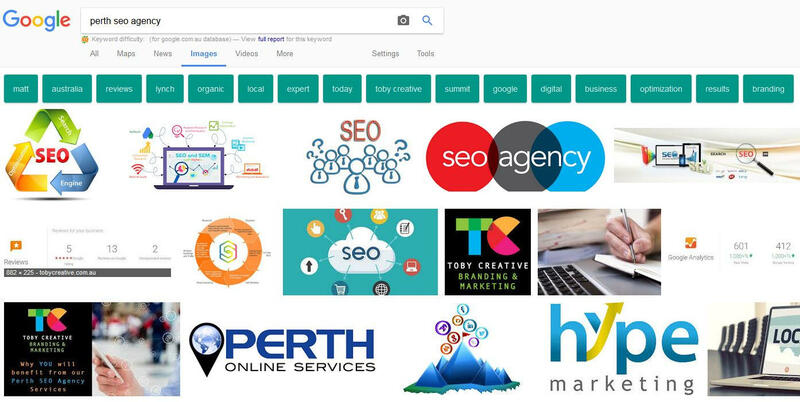 In this example above demonstrating a Google Image Search for the query phrase “Perth SEO Agency”, the results delivered show four images from Toby Creative, which directly assist in driving traffic to our website for this term. Image search can be a major source of traffic for a business, in the case of websites well-optimised for graphics, the number of visits resulting from image search may vary from 20-60% of all visits from Google. Did you know? You can use Google Search Console, in the Search Traffic -> Search Analytics section and filter the search type by type ‘Image’ to show you the attribution of image activities. Optimising images using SEO techniques is very similar to optimising web pages for Google. Do it right, and your images can be found at the top of the image SERPs for the keyword phrase query entered by the consumer. When considering image based SEO, we need to start by using the right image that is relevant and matches the context of your text. The image should be in synergy to the words around it, and not cause any surprises to the reader. Use original images where available, creating fresh design content for your website or post that is unique to your site rather than using popular online image library Photo Stock Art sourced images which may be over-used or visually associated to another brand potentially confusing your audience and damaging brand association. If you are using someone else’s images, remember to confirm that you have the rights to do so and attribute images if you need to use an existing image that is not your own. You need to reference the source correctly. Your smart phone may be a suitable cost-effective and simple source for your evergreen image content strategy, taking regular photos in-situ, at events, functions, meetings, of staff, of clients, your products, or your business location and surrounding area. Optimise the size of the images – the smaller the weight (in bytes) of the image the better. Use Photoshop or similar image editing tools to reduce the size of an image without sacrificing the quality. Keep the image size below 100K. Heavy images are a common error that we see regularly on a lot of websites, where these website owners have no understanding about speed optimisation and user experience and upload whatever the original size of the photo they have directly to their website before editing them down. 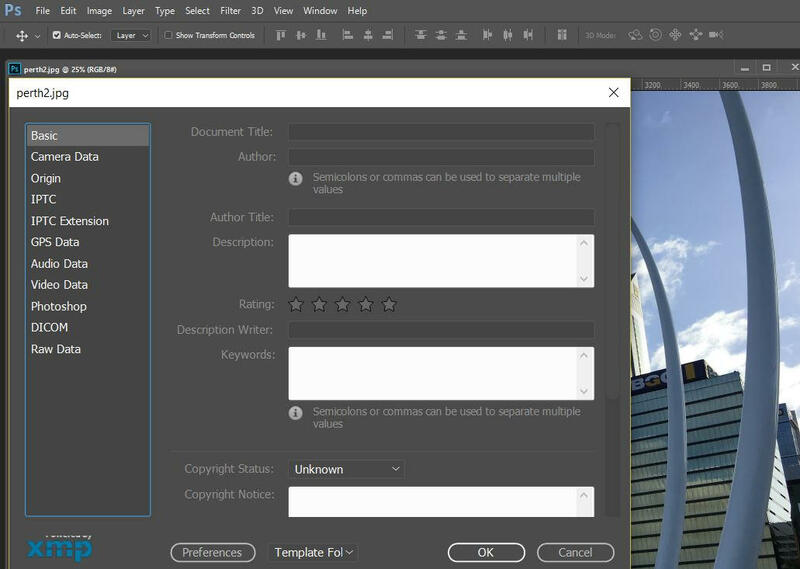 In Adobe Photoshop for a selected image: File -> File Info, you can add additional image meta data including your business contact details, copyright information and even GPS geo location data which can help local search queries. Use ALT tag to describe the image – This helps search engines understand what the image is about. Remember that Google and search engines are smart, but they don’t have eyes looking at the page itself, so they need to use the file name of the image, title, the <alt> tag and the contextual text surrounding the image to determine what is happening to create context. Don’t forget to put ALT tags for images in pages, and be descriptive and keyword focused but don’t stuff them full of keywords! ALT tags are a very good design methodology to utilise as they are required for disabled visitors to your website who may be viewing with a speech device – screen reader that reads the content on the web page out aloud. There are also some web browsers that allow users to “turn off” images when browsing… this is an approach used by some who just want to get to the content text. Alt text, short for alternative text, is a word or phrase that can be inserted as an attribute in an HTML (Hypertext Markup Language) document to tell website viewers what that image is about. Use descriptive filenames – Please do not name your image ‘image1.jpg’ and so on, instead use the filename to explain what the image is. We consider it best practice to use all lowercase lettering for file names, and use hyphens as separators between words. Avoid stop words or small joiner letters ‘a’, ‘in’, and focus on the primary descriptive phrases. Establish a file naming convention to include your brand name, category, location or product/service description. If you utilise images in your blog make sure that you’ve tailored the image name, Alt text & Title attributes for the image. Toby Creative provide a range of image design and photography for Perth businesses. Our Perth SEO services are comprehensively designed to improve your business visibility within the search engine results and include image optimisation for search marketing. Would you like some further information on our range of marketing services? Please phone (08) 9386 3444, email info@tobycreative.com.au or fill in our contact form to book a no obligation free initial consultation at your location so that we can discuss your specific marketing requirements. Some great suggestions in this article which will certainly help local Perth website SEO (Search Engine Optimisation) activities to improve rankings and drive additional traffic to the website from Google image searches. Achieving a coordinated approach with SEO to optimise not just the on-page content, but all other factors which include the images, image title, image filename, image tag, anchor text associated to the image, and even the content within the image which Google’s machine intelligence can determine the colour palette and characteristics of the image will all help to profile and rank for SEO. If you’d like to reduce the size of images but don’t have a copy of Adobe Photoshop then you can use Microsoft’s inbuilt image editor MSPaint which you can find by clicking the Start menu and typing paint. Open the image you’d like to change the size of, then click on “Resize” which is just under “Crop” and just next to “Select” in the menu. Ensure that “Maintain aspect ratio” remains ticked as this will stop the image distorting by keeping the ratio of width to height the same. Depending on where this image will be located on the page will determine how much the size can be reduced, if you’re manipulating a hero image or banner you’ll want to ensure that text is still readable and the image itself isn’t too blurry or pixelated. Finally, check the file size using Explorer. This should give you an idea of how much room you have to move by comparing the original file size to the modified file. There’s a free lightweight image editing tool called Paint.NET that you can download at https://www.getpaint.net/.